The current Brigade of Guards pattern of sword was approved in 1854 and was a steel version of the 1845 Infantry pattern sword without the hinged flap with the individual Guard's regimental badge in the cartouche. In Dress Regulations of 1857, the blades of Guards' swords were ordered to be "embossed", that is etched with their regimental badge and battle honours. A distinction which remains to this day. The sword is carried today in a nickel plated steel scabbard with shoe, mouthpiece and two suspension bands and rings. The sword is also available with a leather Sam Browne scabbard for service wear. 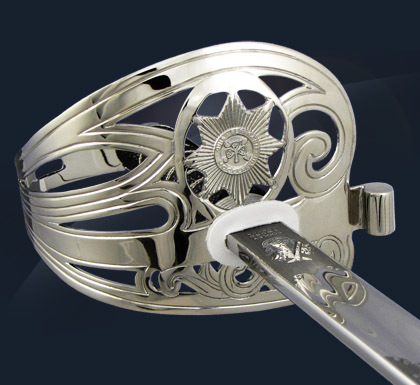 A silver hallmarked guard and hilt can be crafted to regimental requirements.